Harissa is a very hot Moroccan chilli paste, which is quite easy to find in large supermarkets these days. You can blend the chickpeas roughly so that you are left with more of a mash than a purée if you want something to get your teeth into. 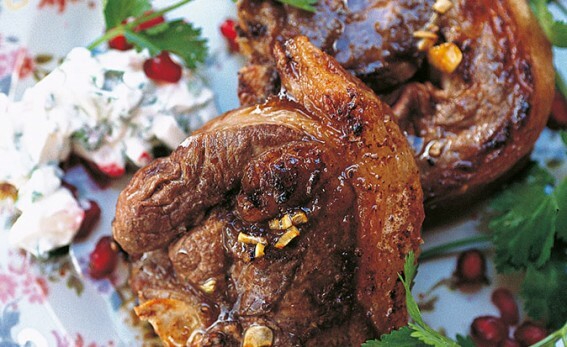 Serve scattered with pomegranate seeds if you have some, with chopped cucumber and plain yogurt on the side. Mix the harissa with the garlic, oil, lemon and mint and put the chops into it, turning them over to make sure they get well coated. Cover and put them in the refrigerator. Leave them to marinate for anything from 1½ hours to overnight, turning them every so often. To make the chickpea purée, simply chuck everything (except the coriander and the optional onion) into the food processor, with salt and pepper to taste, and blend. The mixture doesn’t have to be absolutely smooth. If you can be bothered, fry the chopped onions in a little olive oil until golden brown and slightly singed in some parts. Scatter the onions and the coriander over the purée. Heat a griddle pan for the chops. Salt them at the last minute and then cook them on a high heat for about 3 minutes on each side, until browned but still pink in the middle. You can pierce the flesh to see whether they’re done the way you like them. Serve with the chickpea purée. Couscous or bulgar wheat, mixed with plenty of mint or flat-leaf parsley, is a good accompaniment, or just serve with sheets of warm flatbread and maybe a bowl of plain yogurt.